point of our final climb of the trip. orange glow from the bustling city miles below us in the valley. Today we moved to high camp at nearly 18,000 feet. We enjoyed a breakfast of pancakes and hot drinks before packing our things for the day. We were accompanied by several people from Panaya that had traveled up to our camp this morning in order to help move our things up to our final launching point for the summit. We left the babbling creeks of the meadow and climbed steep rocky slopes to gain the ridge leading to camp. We passed an abandoned gold mine on the way and learned the glaciers here had receded several thousand feet in the past two decades. Once on the ridge proper we were rewarded with a picnic of fresh vegetables, fruit and sandwiches. We quickly gained altitude from here scrambling along the ridge enjoying the ever-amazing views we were presented with along the way. Arriving at high camp we set up our tents and bundled up as the sun started to fade to stars. We had an early dinner and crawled into our sleeping bags to try and get some rest before heading out early in the morning to the summit. we were in the basking glory of the sun and plateau just below the summit proper. back at high camp we were greeted with water and our last spread of sandwiches of the trip. Tired now we packed our things and headed back the way we came. In the meadow were we had our base camp pitched we were once again met by the people of Panaya and their horses to help carry loads the last little way to our resting place of the night and a hot locally raised, grown, and cooked meal of pork and potatoes. With the efforts we extended the day before we slept soundly until the warm sun came around this morning. We all woke to a hot breakfast of eggs, potatoes, and fruit with coffee and tea. We basked in the morning sun remembering the days past. 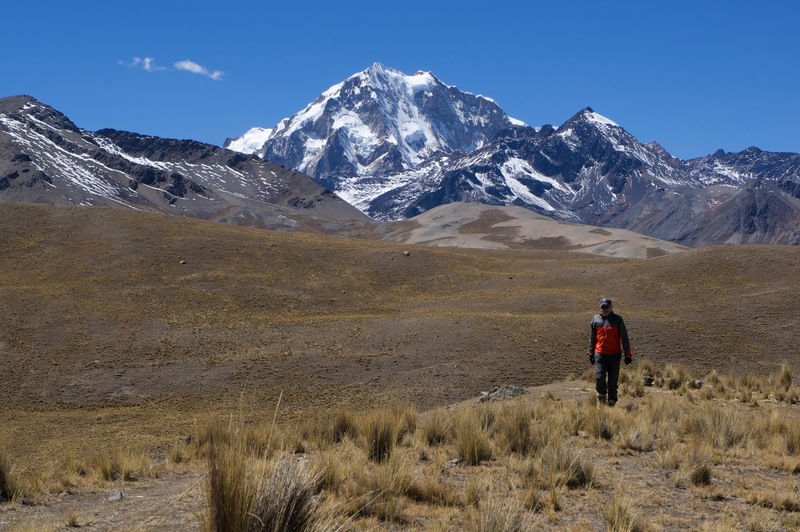 Although we all didn’t stand on top of Illimani we all enjoyed it’s grandeur and were safely able to return from the mountains. As the bus rolled out of Panaya we said our last good byes to the locals and settled into our trip back to La Paz and back to our homes in the U.S.
Mike and I would like to thank everyone that came out into these amazing mountains in Bolivia. We hope this experience last with you for many years to come and that you continue to find your way into the hills. Chad Cochran submitted this set of dispatches via email yesterday, after completing part 3 of the expedition. Photos from the section are at the bottom of the page. 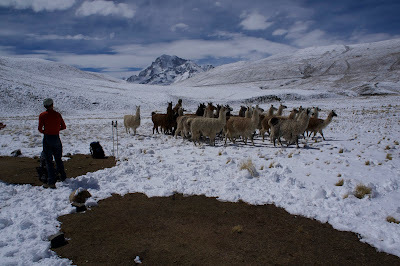 This morning we left La Paz after a good day’s rest yesterday, heading for the foothills of Illimani. 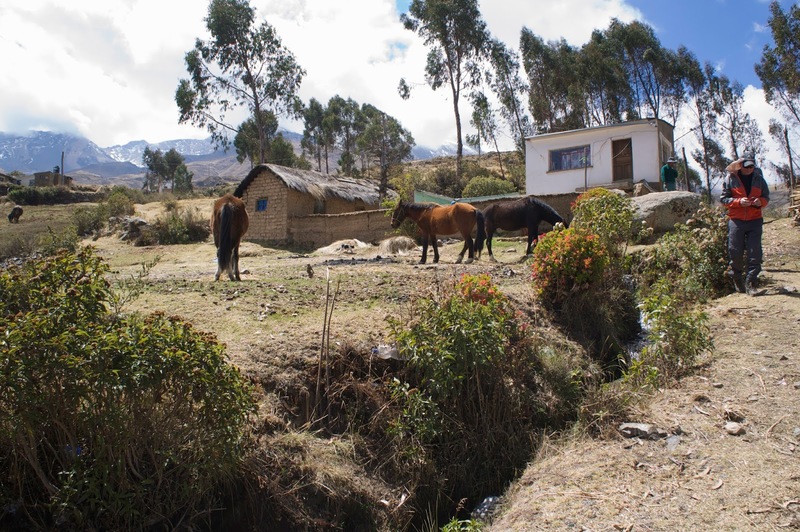 We were quickly transported from the bustling streets of the city to the dirt roads and narrow canyons of the countryside, following rivers out to the base of Illimani. After our scenic morning drive we arrived at the end of the Road in Ponaya, a small town made up of farmers and mountain folk, the starting point of our final climb of the trip. 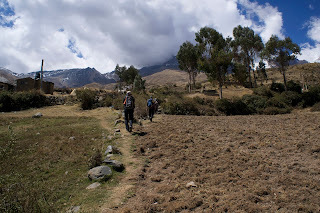 After a spread of sandwiches in town we grabbed our daypacks and walked several miles to our base camp, followed by porters and horses carrying the rest of our things. Through fields and trails constructed by the locals we made our way to a beautiful meadow shadowed by the mountain. As the sun set we prepared ourselves for the days to come, watching the yellow glow of the sky change to a orange glow from the bustling city miles below us in the valley. Today we moved to high camp at nearly 18,000 feet. We enjoyed a breakfast of pancakes and hot drinks before packing our things for the day. We were accompanied by several people from Panaya that had traveled up to our camp this morning in order to help move our things up to our final launching point for the summit. We left the babbling creeks of the meadow and climbed steep rocky slopes to gain the ridge leading to camp. We passed an abandoned gold mine on the way and learned the glaciers here had reseated several thousand feet in the past two decades. Once on the ridge proper we were rewarded with a picnic of fresh vegetables, fruit and sandwiches. We quickly gained altitude from here scrambling along the ridge enjoying the ever-amazing views we were presented along the way. 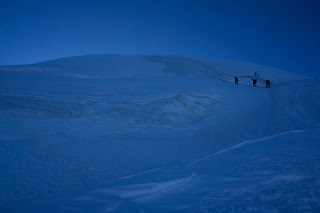 Arriving at high camp we set up our tents and bundled up as the sun started to fade to stars. 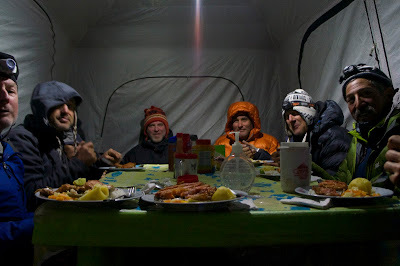 We had an early dinner and crawled into our sleeping bags to try and get some rest before heading out early in the morning to the summit. 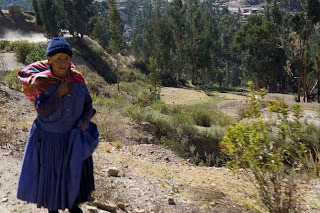 We climbed out of our tents to a still morning air accompanied by clear skies and the night light lent by nearby La Paz. A quick breakfast of hot cereal and a hot drink had us on the move up snow slopes next to camp. The snow had an incredible firmness that lent well to our crampons and made for fairly easy travel on an otherwise steep climb. Throughout the predawn hours we patiently climbed up constantly being reminded of the altitude we were gaining with heavier and heavier steps. Just as the sun broke the darkness of the night we had arrived at the steepest part of the route. Climbing our last mountain of the trip wouldn’t be complete without such an obstacle in the way of the summit. After stopping for a short bit to rehydrate and digest some calories we stepped onto the slope moving up one step at a time until we were in the basking glory of the sun and plateau just below the summit proper. The air warm now we shedded some clothes and walked to the top, looking back at the town were the journey had all began. As the morning hours passed the environment turned from warm to hot. Arriving back at high camp we were greeted with water and our last spread of sandwiches of the trip. Tired now we packed our things and headed back the way we came. In the meadow were we had our base camp pitched we were once again met by the people of Panaya and their horses to help carry loads the last little way to our resting place of the night and a hot locally raised, grown, and cooked meal of pork and potatoes. With the efforts we extended the day before we slept soundly until the warm sun came around this morning. We all woke to a hot breakfast of eggs, potatoes, and fruit with coffee and tea. We basked in the morning sun remembering the days past. Although we all didn’t stand on top of Illimani we all enjoyed it’s grandeur and were safely able to return from the mountains. As the bus rolled out of Panaya we said our last good byes to the locals and settled into our trip back to La Paz and back to our homes in the U.S.
-Chad Cochran submitted this set of dispatches via email today, 9/3 after completing part 2 of the expedition. Chad indicated he will try and send photos later. I will add these when they arrive so be sure to check back, they should be up by tomorrow if they come through. Today we left La Paz and traveled to lake Titicaca. We traveled across the lake to Sirici a small island populated by indigenous ship builders. It was eye opening to see the men on the shores building boats by hand that are used all over the lake. After traveling back across the lake under threatening skies we arrived on shore to enjoy a mouth-watering meal of trout from the lake. In the evening we headed back to the Cordillera Real but not without a stop by a local Artisan market where we observed women making the garments that we bought to use later on the trip and bring back to family and friends. Once arriving at our camp for the night we said good-bye to Sandy and Corine then settled into our camp as we experienced the first snowfall of the trip. We wish Sandy and Corine a safe trip back home. We woke today to over 5 cm of fresh snow, the first sign that we’re in winter here in Bolivia. The arroyo’s put us to shame walking around in sandals packing the llamas and mules while we layered up and laced up our mountaineering boots. We broke camp around 11 am to hike up valley, our hike started with spectacular views of Huayna Potosi and a valley in the midst of spectacular panoramas of the condoriri. We arrived at camp with clear skies but a blustering wind that turned our tents into kites. We all came together as a team setting up camp and were in the cook tent enjoying a mouth watering spread of fresh fruit and sandwiches by sun down. Exhausted from the elements many of the group retired to their tents early with full a full stomach and were lulled to sleep by whistling winds of the Condoriri. Today we had our first glacial experience in Bolivia. With climate change the glaciers have drastically receded over the past century leaving us with small remnants. Spending the morning at the toe of the glacier close to camp, we reviewed basic skills for traveling on snow and ice. In the afternoon we put these skills into practice ascending the lower part of the glacier to a small crevasse in order to practice crevasse rescue and spend some time climbing ice with two tools. 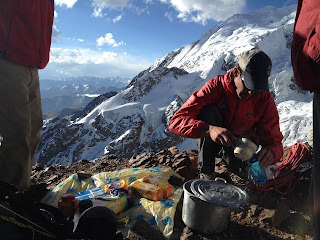 As the glacier moved into the shade we packed our things and descended back to camp for a dinner of warm soup and a delightful meal of chicken and rice. Waking before the rise of the sun we left early this morning to travel higher on the glacier. Working together as a rope team we navigated around several large crevasses and a steep slope to gain a new vantage point of the Condoriri and summit our first peak of the trip, Tarija. 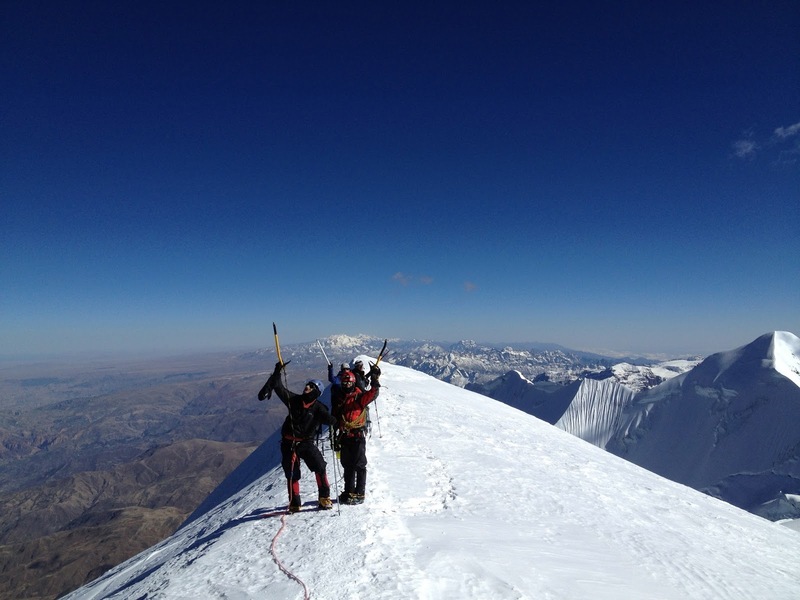 Moving to a new high of the trip, over 17,000 feet, the team set their eyes on Huayna Potosi our goal early next week. We descended back to camp just as the snow was beginning to soften up exposing us to more crevasse hazard teaching the team important lessons about climbing early. At camp we were greeted by warm grilled cheese and tomato sandwiches, holding us over until dinner. 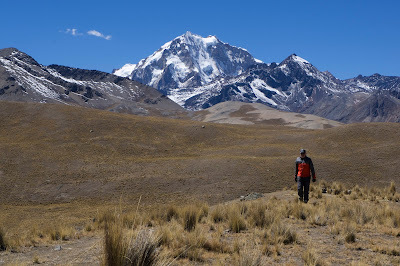 Today we hiked out of camp to climb Cerro Austria, a non-glaciated peak next to camp. The team was rewarded for their climb with incredible views of the Condoriri. 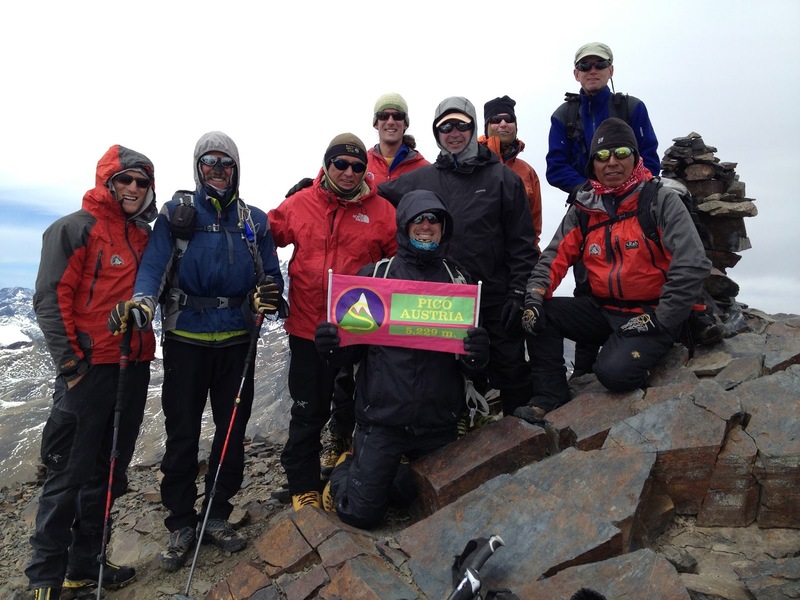 The summit rises just over 17,000 feet, giving us another great opportunity for acclimatization. We spent just under an hour on the summit, taking in the views and relaxing before descending back to camp. We had another mouth-watering lunch of hot sandwiches to hold us over until a delightful dinner of traditional Bolivian, quinoa soup and potatoes. This morning we spent time hanging out in the warm sun. Many of us enjoying a quick bath in the nearby alpine lake. As the afternoon rolled around we headed up to an ice cliff off to the side of the glacier to get some more time climbing vertical ice. There’s nothing quite like climbing perfect blue ice at 16,000 feet. The warm sun turned to snow flurries, giving us a proper winter ice climbing experience. We headed hack to camp as the sun broke out again warming us one last time for the day before it drifted over the next ridge. We arrived to a gratifying Mexican dinner playing board games and recapping our efforts of the day. Climbing ice this high adds quite an extra challenge with the altitude. As we drifted off to sleep last night we heard the pelting of snow on the tops of our tents. With the precipitation and endless activity of the past week we opted to take a full rest day. The team used the day to pack things for the next leg of the trip and hiking around camp. 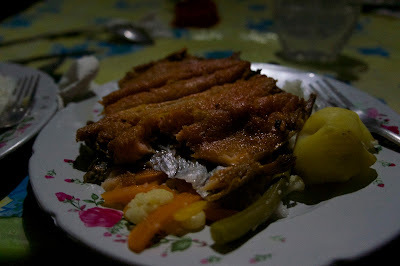 While everyone did their own thing during the day we came together in the evening to an amazing dinner of fresh caught trout provided by the locals of the valley. After a week in the mountains we packed up this morning under some of the beautiful skies we’ve experienced since we arrived in the Condoriri. We trekked out to our rendezvous to find the road down in town was blocked and the bus was delayed, taking a long detour. After a little nap in the warm sun the bus arrived and we loaded our things to set out on the greatest adventure of our trip yet. Because of this year’s election, opponents are trying to secure their places by keeping different populations in the country from voting. Impressively our driver navigated back roads and abandoned farm fields to bring the team back to El Alto with only a short delay. We opted for a hot lunch in town before heading up to our last climbing objective of Bolivia part II, Huayna Potosi. 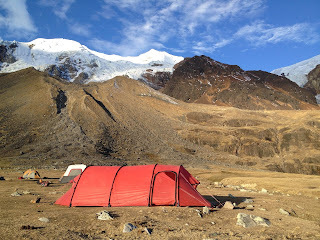 We spent the evening in a beautiful refugio at the base of Huayna Potosi. We had a hot meal and got to sleep in a warm bed. 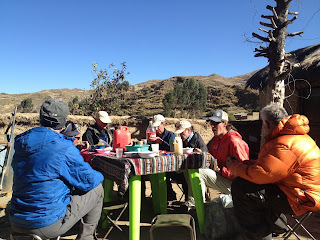 This morning we woke up early to a breakfast of fresh fruit and hot drinks before departing for high camp on Huayna Potosi. We left Casa Blanca, our home for the evening past to hike 2000 more feet to another refugio higher on the mountain. 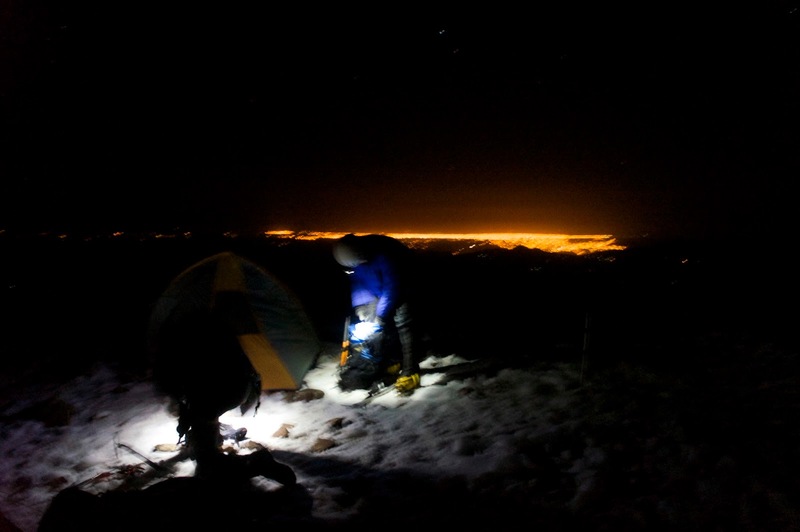 After several hours of hiking we arrived at our launching point for our summit bid of the next day. Getting there early allowed us to rest up and enjoy the warmth provided by the hut. We packed our things, had a light dinner and were in bed just as the sun set, anxiously waiting our adventure of the next day. Summit day! We rolled out of bed at around 1 am this morning to grab some food and a hot drink before gearing up and heading out to make our summit bid. We were greeted by an incredible wind giving us an extra challenge to gain the summit. 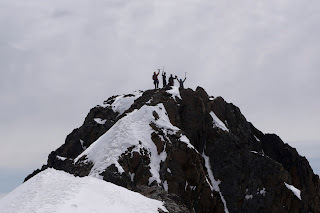 Everyone made a valiant effort to reach the summit of Huayna Potosi but due to the conditions several of us had to turn back evading the elements. For those that endured the cold temperatures and gusts of up to 50 mph they were rewarded for their efforts with an incredible panorama of the Cordillera Real. An exposed summit ridge took us to the summit proper were we didn’t stick around long with the winds keeping one from being completely comfortable in the morning sun. We all regrouped at high camp to share stories of the morning and head back down to the waiting bus. While everyone didn’t make it to the summit we all had an amazing experience on Huayna Potosi. After arriving back to La Paz we split to clean our selves up before heading out for a celebratory dinner at an Argentine Steak house not far from the hotel. At this point in our Bolivian travels we say farewell to two more of our guests Craig and Greg. It has been a pleasure to spend time in the mountains with you both.